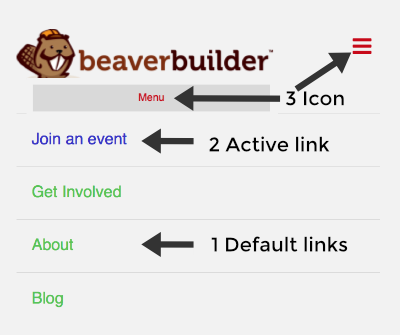 If you use the Beaver Builder Theme, you can use a CSS rule to customize the color of the hamburger icon or MENU text on small devices. You can also add custom CSS to customize the link colors in the mobile menu, which expands when you click the hamburger icon or menu text. Tip: See the Related Articles for a refresher on where the default menu colors come from. Depending on the header layout, you may be able to change the menu link colors with the standard settings on the Header tab. Paste in the following CSS code. See the article on where to put CSS code. Change the colors in each rule to your custom colors. Remove the first two .fl-page-nav-collapse rules if you don't want to customize the color of the expanded menu links. Make sure the screen size you're viewing the result on is less than the max-width in the @media wrapper in Line 2. In the example above, the rules only apply when the screen size is less than 767px. Adjust the max-width in Line 2, or if you want the rules to apply at all screen sizes, remove the @media wrapper by removing Lines 2 and 12 .